How do girls stand out in a male dominated art form? Jessica Pabon, Assistant Professor of Women’s, Gender, and Sexuality Studies at SUNY New Paltz, examines the underground culture of graffiti from a feminist perspective. Dr. Jessica N. Pabón is Assistant Professor of Women’s, Gender, and Sexuality Studies at SUNY New Paltz. As an interdisciplinary feminist scholar, she teaches courses including Gender and Sexuality in Hip Hop, Performing Feminism, and Latina Feminisms. She is published in Women & Performance: a journal of feminist theory, Rhizomes: Cultural Studies in Emerging Knowledge, and TDR: the journal of performance studies. She was an AAUW Dissertation Fellow (2012-13) and a speaker at the 2012 TEDWomen Conference. 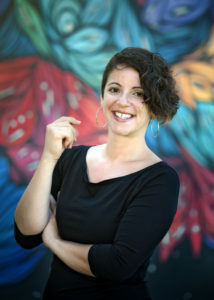 Her most recent publication “Ways of Being Seen: Gender and the Writing on the Wall” appears in the Routledge Handbook of Graffiti and Street Art (2016), and in October 2016 her essay “‘Daring to Be ‘Mujeres Libres, Lindas, Locas’: An Interview with the Ladies Destroying Crew of Nicaragua and Costa Rica” will be published in La Verdad: The Reader of Hip Hop Latinidades (The Ohio State University). Her book, Graffiti Grrlz: Performing Feminism in the Hip Hop Diaspora is under contract with NYU Press. She blogs at www.jessicapabon.com and tweets from @justjess_PhD. Unlike other kinds of street art, Hip Hop graffiti writers use AfroCaribbean aesthetics (like call and response and self-naming) to assert their voices and claim belonging to a place by writing their name on a public surface. Because writing graffiti is a deviant subcultural act that takes place on the street, the social structure has been characterized as a “boys club” tied to cismale masculine identity formation since its inception over 40 years ago. Thus, when we see graffiti, we imagine a man with spray paint in hand—effectively erasing “graffiti grrlz” (that’s girls with a z) from the subculture. I’ve spoken with over 100 graffiti grrlz, aged 18-56, across 18 different countries. I’ve listened to stories from grrlz who were amongst the first to paint in their cities—like ABBY106 from the USA and Prima Donna from Brazil—as well as grrlz who look up to those trailblazers, such as Motel7 from South Africa and Evay from Scotland. I’ve found that these grrlz actively resist their erasure and elevate their status by performing acts that I characterize as feminist because they have the effect of creating transnational solidarity, fostering empowerment, cultivating community, reclaiming pleasure and joy, and restoring bodily agency. Despite the strategies of resistance they enact to thrive as grrlz in a male-dominated subculture, their importance to transnational feminist movement hasn’t been acknowledged. By centering graffiti grrlz’ experiences, my research postulates a new way of seeing feminism and recognizing feminist movement—one that privileges the subcultural over the mainstream, the deviant over the respectable, the transnational over the Eurocentric, and the intersectional over the essential. Grrlz wield spray paint to claim public space all over the world, now imagine that.